Chicken is a weekly staple which makes it an excellent candidate for flavor experimentation. Garlic, herbs and lemon are a personal favorite but I like to venture outside the box to bring a new, inviting chicken dish to the dinner table. These quick and easy Peruvian inspired grilled chicken thighs is one such recipe. The spices are bold and exciting but definitely ones you can use in many other dishes. 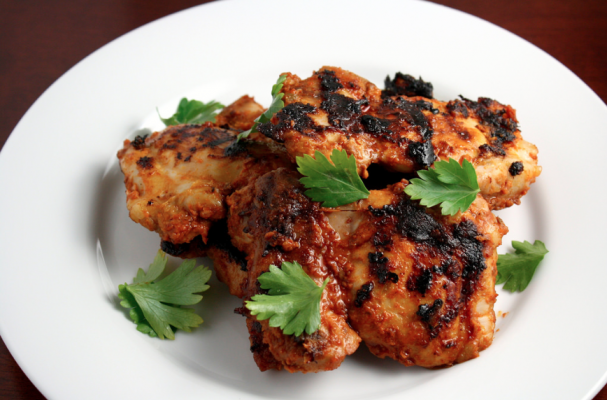 If you are reaching for something different these days, give these grilled chicken thighs a try. Step 1: In blender or food processor, place tomatoes, red onion, garlic, red peppers, cilantro leaves, salt and pepper; process until smooth. Step 2: In small bowl, mix together coriander, cayenne and salt; rub thighs with mixture. On prepared grill, place chicken and cook, turning, about 12 minutes or until internal temperature of 160 F. is reached when tested with a thermometer. Spoon rice onto 4 individual plates, top with Tomato-Cilantro Sauce and arrange chicken on top. Garnish with avocado slices and dollops of sour cream.